Whether it’s a keynote, conference, lecture, commencement, graduation, or private gathering, I tailor my presentation to your needs. In addition to giving talks, I also emcee galas, fundraisers, awards ceremonies, holiday gatherings, and celebrations, and can moderate your panel or interview an author or other celebrity guest for your event. Hey! A Way with Words is on the road! Check out our Winter 2018-2019 Tour. Grant Barrett and I will be appearing together in: Portland, Oregon; Dallas, Texas; Indianapolis, Indiana; San Diego, California; Washington, DC. ; Brooklyn, New York; Arcata, California; Milwaukee, Wisconsin; Madison, Wisconsin. Don’t see your town on the list? Take this survey to let us know where you are, how you listen, and that you want us to come to your town! Dorothy Marie Lowry Distinguished Lecture Series. Saddleback College, Mission Viejo, California. April 26, 2019. Literacy Texas statewide conference, Keynote, Waco, Texas. August 6, 2018. A Way with Words in San Antonio, St. Philips College, Presentation with Grant Barrett benefiting San Antonio Youth Literacy. San Antonio, Texas. June 21, 2018. A Way with Words in Huntsville!, US Space and Rocket Center, Presentation with Grant Barrett, Huntsville, Alabama. May 10, 2018. University of San Diego. “The Idea of Beauty Series: Language of Beauty.” Reflections and panel discussion. San Diego, California, April 10, 2018. Word of South, A Festival of Music and Literature. “The Joy of Lex.” Presentation, Tallahassee, Florida. April 14, 2018. 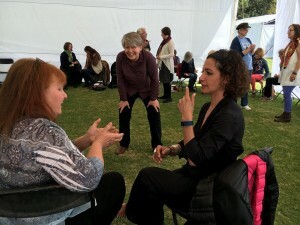 California Association of Teachers of English (CATE), Keynote and improv workshop, annual state conference, San Diego, California, March 9, 2018. San Miguel Writers Conference/Festival Internacional de Escritores en San Miguel. San Miguel de Allende, Mexico. Improv Workshop. “Unlock Your Creativity with Improv!” February 2018. Special Libraries Association, Southern California Chapter, holiday party, Los Angeles, California. December 7, 2017. Indiana State University. “A Way with Words: Celebrating the Cordell Collection and the Schick Lecture Series.” November 9, 2017. University of San Diego. Moderator, “Restoring Respect” conference, Institute for Civil Civic Engagement, April 18, 2017. San Diego Center for Jewish Culture (CJC). “An Evening with Martha and Grant.” April 27, 2017. California State University San Marcos. Interview with bestselling author Sara Pennypacker and illustrator Jon Klassen, sponsored by Art=Opportunity and the Stuart Foundation, San Marcos, California, March 1, 2017. Butler University, Keynote, College of Communication Symposium. “Communicating Differences.” Indianapolis, Indiana, March 2, 2017. National Association for Interpretation, Keynote, regional conference, “Roots and the Land,” Shepherdsville, Kentucky, March 8, 2017. 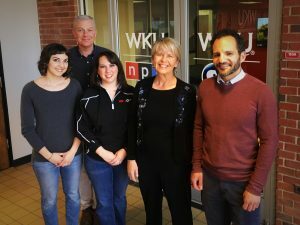 Western Kentucky University. Lecture. “The St8 of English? Gr8!” Bowling Green, Kentucky. March 9, 2017. San Miguel Writers Conference/Festival Internacional de Escritores en San Miguel. San Miguel de Allende, Mexico. Improv Workshop. “Unlock Your Creativity with Improv!” February 2017. Interviewer, a conversation with the groundbreaking musical duo Black Violin for educators and students, California Center for the Arts, Escondido, sponsored by Art=Opportunity. February 2, 2016. California State University San Marcos. “Improv and Literacy.” October 12, 2016. San Diego Unified School District. Title I Boot Camp, “Learning Through The Arts.” September 22, 2016. Community College of Vermont. “Do You Hear What I Hear?” Winooski, Vermont. September 15, 2016. Burlington Book Festival. “You Have a A Way with Words.” University of Vermont, Burlington, Vermont. September 17, 2016. San Miguel Writers Conference/Festival Internacional de Escritores en San Miguel. San Miguel de Allende, Mexico. “Improv for Writers.” February 15, 2016. Keynote: National Conference, Community College Humanities Association. Phoenix, Arizona. November 5, 2015. Majestic Theatre. Dallas, Texas. “An Intimate Evening with Martha and Grant,” to benefit the Aberg Center for Literacy. April 23, 2015. Tarrant County College. Fort Worth, Texas. Lecture, “Civil Discourse in a Diverse Society.” April 24, 2015. CareFusion Global Headquarters. San Diego, California. “Do You Hear What I Hear?,” an interactive workshop on language and diversity in the workplace. June 5, 2014. Osher Lifelong Learning Institute, University of California San Diego. “Buff Up Your Brain and Maximize Your Memory.” May 30, 2014. Emcee, national conference of the National Association for Bilingual Education, San Diego. February 13, 2014. Emcee and Auctioneer. Buena Vista Audubon Society annual fundraiser, Oceanside, California. February 22, 2014. Sidestage Improv. “Cacchinate.” San Diego. February 23, 2014. Interviewer/moderator. A conversation with bestselling author Alice Hoffman (Practical Magic, The Dovekeepers), for Words Alive! literacy organization. La Jolla, California. November 12, 2013. Interviewer/moderator. A conversation with bestselling author of The Kite Runner, Khaled Hosseini, onstage at the Museum of Contemporary Art, La Jolla, California. June 26, 2013. 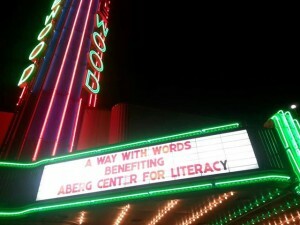 “An Evening with Martha and Grant,” a sellout appearance to benefit the Aberg Center for Literacy. We also emceed a Jeopardy!-style quiz for local celebrities, including Dallas mayor Mike Rawlings. Dallas, Texas. May 16, 2013. Panelist. 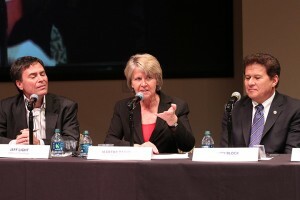 “Restoring Respect,” Second Annual Conference on Civility in Public Dialogue, at the Joan Kroc Institute for Peace & Justice, University of San Diego. February 20, 2013. Celebrity designated speller alongside my radio partner Grant Barrett. San Diego Council on Literacy Adult Spelling Bee. Hall of Champions, San Diego. February 27, 2014. Luncheon speaker. Community College Humanities Association (CCHA) Pacific-Western Division Conference, “Exploring Histories in the Humanities.” Portland, Oregon. October 26, 2012. Interviewer/moderator. Words Alive! annual Authors Luncheon and fundraiser for this San Diego literacy organization. An onstage conversation with New York Times bestselling author Vanessa Diffenbaugh about the language of flowers, November 13, 2012. Lecturer, with my co-host, Grant Barrett. “Three Centuries of American English,” in conjunction with the “Behold America“ exhibit, San Diego Museum of Art. November 15, 2012. • Keynote speaker and workshop leader with my co-host Grant Barrett. Writers’ Forum, Intuit Corporate Headquarters. Mountain View, California. September 12, 2012. • Keynote speaker, Diversity Summit, Sempra Energy, Downey, CA. July 12, 2012. 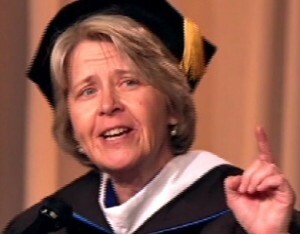 • Commencement Address, National University graduation ceremony, Sacramento Civic Center, Sacramento, California. April 22, 2012. More about the event here. • Courtside Announcer for the Mercury Insurance Open, a professional tennis tournament, at the La Costa Resort & Spa in Carlsbad, California. July 30-31, 2011. • Lecture, Congregation Beth Israel. “The Joy of Lex.” March 17, 2011. • Sunday-morning Speaker, Chalice Unitarian Universalist Congregation, a church in Escondido, California. “Pursuing Your Passion.” February 20, 2011. • Luncheon featured speaker, the Wednesday Club, the venerable women’s artistic and cultural organization founded in 1895. This a holiday-themed presentation was titled “Unwrapping the Gift of Words.” December 1, 2010. • Luncheon featured speaker, Brandeis University National Women’s Committee, North County Chapter of San Dieguito. This organization philanthropic arm of the University raising money for scholarships as well as support of campus libraries. “Why I Love Libraries.” Morgan Run Club & Resort, Rancho Santa Fe, California. May 24, 2010. • Lecture. Osher Lifelong Learning Institute, University of California San Diego Extension. “The Joy of Lex.” April 13, 2010. 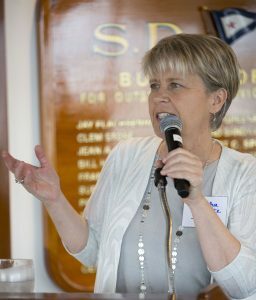 • Featured Speaker, La Jolla Golden Triangle Rotary. December 4, 2009. • Speaker, Marion County Public Library, “A Garden of Words.” Indianapolis, Indiana. April 13, 2008. • Guest Host and Speaker with my radio partner Grant Barrett for “Alphabet Affair,” a fundraiser for the Indianapolis literacy organization, Indy Reads. Hyatt Regency, Indianapolis, Indiana. April 12, 2008. • Awards presenter at the 31st Annual American Crossword Tournament in Brooklyn, New York. This is the big event organized by our friend NPR Puzzlemaster Will Shortz. March 28, 2008. • Emcee for fundraising gala with sports legends Maria Sharapova and Pam Shriver at the Acura Classic Tennis Tournament. This event raised $256,000 for the Scripps Polster Breast Care Center to support breast care prevention, treatment, and early detection. La Costa Resort and Spa in Carlsbad, California. August 2, 2007.